The house beer at the Staminee de Garre in Brugge. Draft and 1500 ml. bottles. UPDATED: MAR 22, 2019 Quite good. Not so spiced and quite strong in alcohol leves but still respectable as a Belgian tripple. Nice foam and cool shape. UPDATED: DEC 31, 2018 22 December 2018. 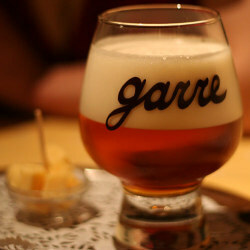 De Garre, Bruges. Cheers to Madoc! Finally rated the house beer of De Garre, located in 'de Garre van Kornee', one of the narrowest alleys in my hometown, after I discovered I still hadn't yet. Pours clear golden to orange with a big, lasting, frothy, white head; lots of lacing. Looks dashing. Aroma of white pepper, white bread, yeast, yellow apple, canned peach, pineapple, some white cabbage (but not overly DMS-like to me). Taste is medium fruity sweet, hints of pineapple & peach on a malty white bread basis, rendering a yeasty effect too. Light to medium spicy bitter then, white pepper, faint clove, somewhat phenolic & typically Van Steenberge in that aspect; sourish lemon or wheat in the back. Dry, peppery & grassy hoppy finish, lingering yeast, bread, phenolic again, finally some warming jenever alcohol. Medium body, oily texture, soft to flat carbonation. Good stuff but not very sophisticated; surprised to see it's in the top 50 of Abbey Tripels... Probably says more about the style, then? UPDATED: DEC 28, 2018 Tap at De Garre, Bruges. Orange-golden. Loads of head. Sweet and creamy taste. Notes of lemon, herbs and caramel. Very drinkable. Really good tripel. UPDATED: FEB 16, 2019 Tripel perfettamente bilanciata, dolciastro sempre più acutizzato fino al retrogusto, in cui spicca l'alcol comunque meno percepito rispetto alla sua reale portata. Huge white fluffy head on a translucent golden body. Banana & spice aroma. Medium bodied, super smooth on the palate. Banana, Belgian yeast, spices & vanilla tastes with a strong alcohol presence on the back. Hazy orange gold, extraordinary white head, dense, stays throughout, and leaves excellent lacework. Aroma is predominantly sweet, sugar, honey, soft fruit. Carry through to the taste, which should be less balanced than it somehow is. Moderate carbonation. Nothing this strong should be this drinkable! On tap at the Yard House in the LINQ Promenade. Pours a cloudy, orange color, with a big, foamy, off-white head. The nose is apple juice, brown sugar, oak, some booze, toast, caramel, and apricot. Sweet and fruity, with a light bitterness. Heavy body, with a sharp, grainy, and lightly acidic mouthfeel. Pretty solid. This is an amazing beer, the best Tripel I have ever ever tasted. Easy to drink and sneaky strong. Simply delicious.